***SqlError: [08S01][Microsoft][ODBC SQL Server Driver][Shared Memory]General network error. Check your network documentation. ***SqlError: [Microsoft][ODBC SQL Server Driver][SQL Server]Ad hoc update to system catalogs is not supported. FinalSqlOperations::Could not enable SQL CLR. 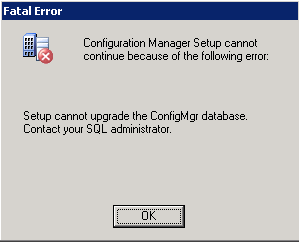 Setup cannot upgrade the ConfigMgr database. Contact your SQL administrator. So…I searched on everything in those log entries and came up blank. Ad-hoc updates are enabled. Setup was successfully enabling SQL CLR. Something was still failing. I finally came across this forum thread where a user stated that the problem in their environment was the SQL authentication mode. Now…I’ve always seen that message during the prereq check, but since it is a warning instead of an error, I have always ignored it…and have never had a problem until now. After changing the SQL authentication mode to be only “Windows Authentication”, the setup went through without a problem.